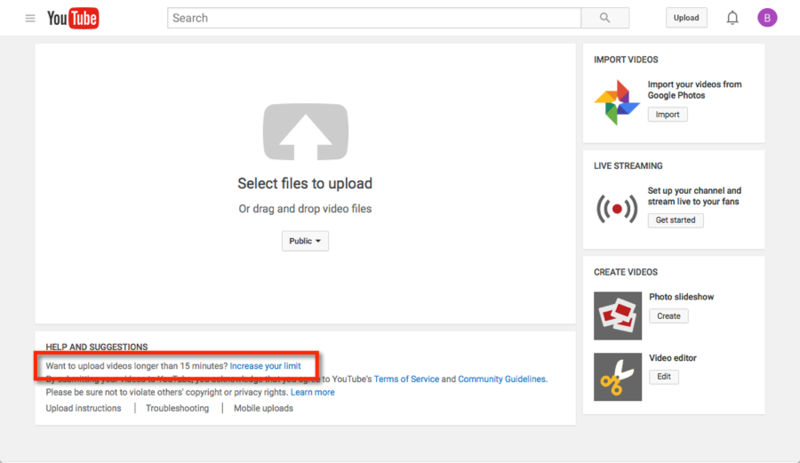 By default, YouTube allows video uploads that are up to 15 minutes long. If you try to upload videos longer than 15 minutes, the upload will fail. This is a YouTube limitation rather than a Brightcove limitation. Open the YouTube upload page at https://www.youtube.com/upload. Click Increase your limit link at the bottom of the page. Note: If you can't find the Increase your limit link, it's possible that you may already be able to upload long videos. Check the Longer videos section in your YouTube Account Features page to check if the feature has already been enabled. Follow the steps to verify your account with a mobile phone. When you receive a text message from YouTube in response, enter the verification code from the text message and click Submit. YouTube will then confirm when your YouTube account has been activated for longer uploads. From this point, any videos longer than 15 minutes in your Video Cloud account will be synced to YouTube.